87 families have already visited the Museum at Prairiefire in Overland Park, Kansas. Are you one of them? Thanks to a donation from and partnership with the Museum at Prairiefire, Cass County Public Library patrons can checkout museum passes for free! Checking out a museum pass gives a family of 4 admission for 3 days, perfect for a weekend. The pass will give you access to a majority of exhibits. Some special exhibits may cost an additional fee. 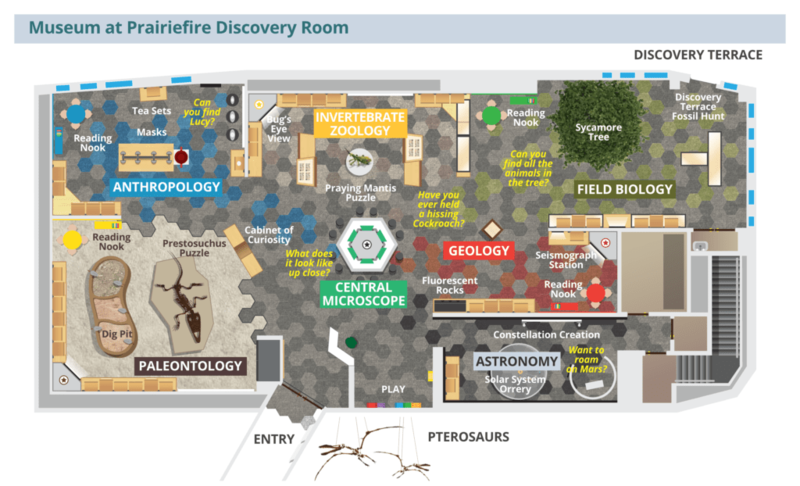 Museum at Prairiefire Discovery Room Map. Click to enlarge. When you check out a museum pass, you will receive a receipt with the pass’s number on it. KEEP THIS RECEIPT as it is your admission to the museum. Then, grab the family and head out to the museum. Show them your receipt and explore the museum. The Museum at Prairiefire is located at 5801 W 135th St, Overland Park, KS 66224 and is open from 10am to 5pm Monday through Saturday and 12pm to 5pm on Sunday. To get to the Museum, take Missouri Highway 150 west toward Martin City. Continue on 135th Street. The Museum will be on the left after Nall Ave. The Museum at Prairiefire (MAP) was founded in 2008 and opened in 2014 through a partnership with the American Museum of Natural History. This collaboration is the most extensive of its kind, giving the MAP premiere access to the American Museum of Natural History’s timely and scientifically accurate exhibitions, renowned educational resources, and some of the best scientists in the world. For more information, visit their website: https://visitthemap.org/. Have you visited the Museum at Prairiefire? Leave us a comment and tell us what you thought.